You're still desperately trying to define atheism to suit your own wishes. It's a straw man. Of course it's possible for a child to be ignorant about the shape of the earth. It looks flat, but people tell me it's round. I don't know what to believe. 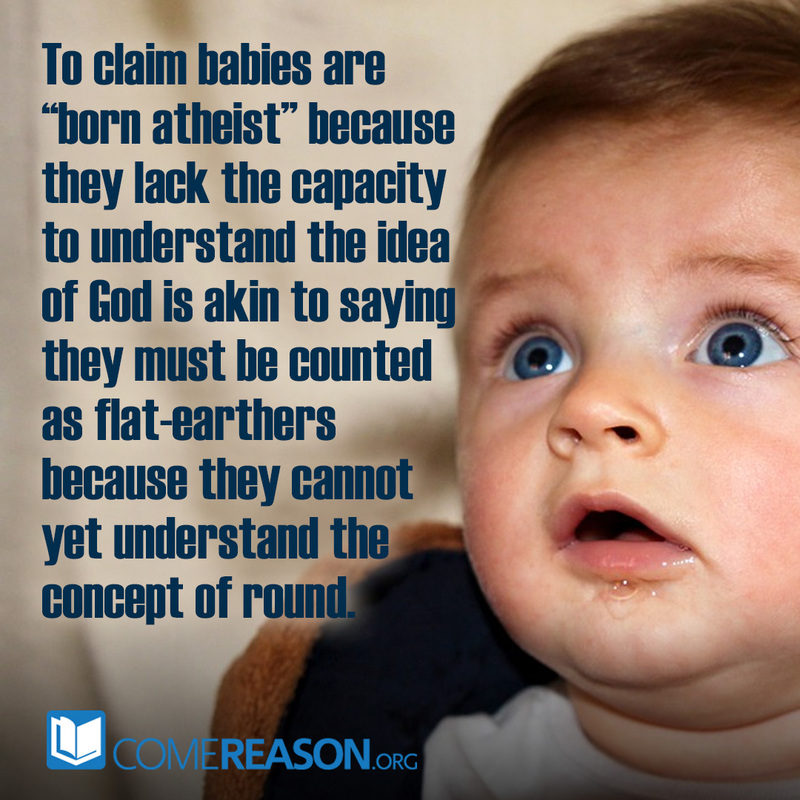 Atheists are like children when it comes to God stories - they don't know what to believe! The world looks one way, but people tell me there's something different. Maybe what you're reacting to is the fact that atheists get annoyed by overbearing theists who threaten them and cajole and punish. I admit I dislike such pushy theists, but that doesn't mean I'm taking a position on their theism. Awful people could still be right about things. Why do you so desperately wish atheists would take a stand against God? Why do you adamantly refuse to admit that ignorance exists? You admit that sin exists, right? So why not accept the existence of ignorance? It's about the same thing. "You're still desperately trying to define atheism to suit your own wishes." That's hilarious. I'm using the classical definition that is in all the philosophical literature. I'm changing nothing. It the atheists who are the ones redefining the term. So you'll be rhetorically happy if it said all babies are agnostic and non god believers. Right? No knowledge claim there! No! Agnosticism means withholding a belief. Look, a Canadian in Montreal can believe it's better to speak French primarily or he can believe its better to speak English. Some say it doesn't matter. But a baby isn't making that choice at all because the baby doesn't yet know how to speak. To say the baby chooses--even if that choice is not to favor one over the other--is to ascribe value where none exists. WARNING: The following is a paragraph, not 3 individual sentences and not 5 individual claims. Quoting one claim without quoting the rest of the paragraph along with it is quote mining. Conflation of denying theistic positives (what they claim to do) with asserting theistic negatives (what they actually do) is something I get a lot from atheists, and the fact that they blindly assert/assume theistic negatives is the problem. If atheism were merely a lack of belief then atheists wouldn't claim to be absolutely sure that "there is no God" as they always do, nor would they go on the offensive and psychologically attack Christians for believing — no, instead, they would simply ignore them and going about their own way, as we all do with things like the flat earth claim that we know because of pictures of Earth from space to be absolutely false. The idea that atheism is merely a lack of believe is directly contradicted by atheist behavior. Wow, I'm not sure one could stretch this far to make an argument if they were made of rubber bands or play-doh. Children are blank slates. Until they develop the capacity for logic and reason, they learn what they are taught from adults and authority figures. You teach a child to speak french? They speak french. You teach a child to believe in santa? They believe in santa. Same with gods (pick one.) Until you teach them about gods, they are atheist. This post/article/blurb is one of the silliest things I've read, thanks for the entertainment. By your same definition then they're not atheists until someone tells them there is no God. "Atheism makes a knowledge claim about God's existence; therefore, one must teach his or her children there is no God. If atheism were the default position, then history would be littered with civilizations and cultures that were atheistic. But those don't exist. " Those are two different claims. First, atheists who adhere to the strict rules of logic make no claim about god's existence. The burden of proof lies with the claimant, those who claim god exists. Atheists may say they feel the evidence presented for god's existence is insufficient, but that's it. On a personal level, of course atheists claim gods don't exist, but formally, atheists can't make that claim. Second, non-belief in the existence of something HAS to be the default position. You can only believe in something if the evidence for its existence is convincing. If I tell you I have a dragon in my garage, naturally you'd want proof, and that proof would have to be pretty compelling: extraordinary claims require extraordinary evidence. On the other hand, if I told you I have a 12-year-old Jeep in my garage, you still might want proof, but that is far more believeable a claim, and thus the evidence need not be extraordinary. Parenthetically, that belief in gods exists in all cultures doesn't mean that gods exist. Most psychologists and neuroscientists agree that god belief is hard-wired into our brains by evolution, and stimulation of a certain area of the brain (the name of which escapes me at the moment) produces "spritual experiences." More to the point, no one believes in a god until they are told to do so. If what you are saying is true, then children born in, say, Saudi Arabia or India should believe in Yahweh rather than the religions into which they were brought up. Yes atheists can make the claim God doesn't exist. Theism makes no claim,about God's existence in and of itself. It only states a belief. By definition an atheist is simply someone that doesn't believe that god (any god) exists. That's very different from believing that god does not exist. But back to children - until someone tells them that god exists they don't know anything about god or gods so how can they believe in him/her/it/them? By definition that makes them an atheist (more accurately an agnostic atheist). It's not until someone tells them about the bible and god that they can become a theist. But, the thing is, tell them about Santa and they'll believe as well. Ditto the Easter Bunny. The Tooth Fairy. Whatever. God (whether the god of the bible or some other deity) is not different. "By definition an atheist is simply someone that doesn't believe that god (any god) exists. That's very different from believing that god does not exist." Maybe I'm just slow, but how are those two statements different? Atheism would not exist without creating a belief in a god. Gods have been invented because man could not explain the natural events of the world such as the sun rising etc. Born as an atheist has undeniable logic, common sense and science on its side. It is impossible to be anything else than atheistic until cognitive submission or dissonance can function at a concentration level when the process of indoctrination is easily applied to the young absorbing mind into any religions, cults, flat earth theories or political systems. If you are a theist where your ideology must be the truth over everything just as history has shown us since gods and religions were created by man, you will of course reject any rational and scientific explanations just as they did. I think you're confusing agnosticism (the uncertainty of whether god exists or not) with atheism (the certainty that god does NOT exist). Good post. I am indeed embarrassed when my fellow skeptics try to turn children into atheists. You must hang out with some less extremist sceptic type friends. As a self-imposed counter apologist, your statement appears to insinuate this is common behaviour for sceptics\ atheists. Never in my many years of life as an atheist have I ever witnessed such behaviour from atheists, however I do understand there are exceptions in everything. If they can say all babies are born Atheists we can say all the dead are Christians. Neither of those are true based on the classical definitions of the terms, but it's based on some current shallow redefinitions. 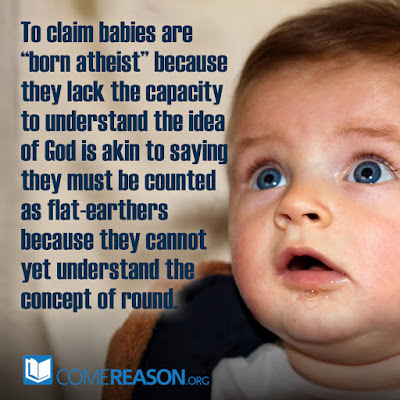 Considering the observable evidence and based on the most sensible and obvious conclusions, all I can believe is this baby assertion is just another twisted Christian fable based on no evidence and is not of any real consequence at all, just as if you die a Christian, Muslim, Hindu, Jew or atheist etc. Superstitious proclamation can only be the result of the mind, altered through emotional repetitious religious preaching. A theist is someone who has a belief in God. If you don't have that belief then you can't be called a theist. And if you're not a theist then, yes, you're an atheist. So sure, babies are atheists. "we can say all the dead are Christians"
Only if you can show that all dead people have accepted Jesus Christ as their lord and saviour.